Now that the State Grange session has just passed, we are on our way to a new Grange year. We are starting fresh with new officers and new committees. The Legislative Committee has a few changes, with a few old members remaining and some new ones joInIng us. The biggest change is that Gordon Gibson has stepped down as Chairman of the Legislative Committee after many years of service to this committee. Don't worry, he is not going far. It is my honor to have been asked to be the new Director of the Legislative Committee. I have been working with Gordon the last two years as a member of his committee. I am a member of Echo Grange in Mansfield of which I am a Past Master. I have also served as Past Master of Little River Grange and Quinebaug Pomona. I am also a former State Lady Assistant Steward and also have served as both Youth and Junior Directors for the State Grange. I am presently working at the University of Connecticut in Student Financial Aid Services. I have previously worked in the Connecticut House Republicans office in Hartford. I would like to introduce our new committee and highlight their skills. Remaining with us is George Ward from Harmony Grange. He is a Past Master of Harmony, Farmill River and Fairfield County Pomona. He is a past Deputy of Pioneer Pomona. He is also active in the Masons. George is a retired engineer who is certified in 3 states. George retired after 20 years as the Director of Marketing for a Norwalk Company. Dr. Charles Dimmick is also remaining on the committee. Charles is a member of Cheshire Grange where he has served as Master as well as bing Past Mater of New Hven County Pomona. Charles is Professor Emeritus of Geology at Central Connectucut State University. He is presently Vice-President of the Connecticut Association of Conservation and Inland Wetlands Commissions and is on the Directors and a member of the Legislative Committee for the Association of Fairs. Joining us as a new member is Russell Gray from Ekonk Grange in Sterling. Many of you remember that Russell is a Past Master of the Connecticut State Grange. He has also served as Master of both Ekonk and Quinebaug Pomona. Russell is currently First Selectman for the Town of Sterling which by nature involves him in Inland Wetlands, Planning and Zoning and Economic Development Commissions, as well as the Historical Committee. The last new member joining us is Earl Phillips from Eureka Grange in New Hartford. He is Past Master of Eureka and Mountain County Pomona. Earl has served as Deputy under three different State Masters. He is retired from Patrons Mutual Insurance Company after 35 years. Remember I said that Gordon was not going far? Gordon, as a member of the State Board of Directors / Executive Committee, is still part of the Legislative Committee. He will now be acting as our Legislative Liaison. 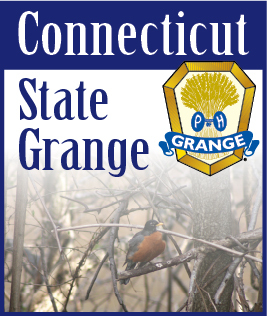 Gordon will be our spokesman in Hartford, communicationg the State Grange positions to the legislators and testifying on behalf of the State Grange. His past experience in Hartford and his knowledge of the issues and players is indispensible. This committee is very diverse in skills and represent all areas of the state. Feel free to contact any of the committee members for assistance with legislative issues. We will be happy to assist with any resolution writing or to assist in legislative programs. Gordon and I attended the Northeast Regional Leislative and Agricultural meeting that was held at the Big E on Grange Sunday. Ernie Finch, the Agricultural Director and our Master Bob Sendewicz were also present. Eric Jenson from the Pineland Farms in Maine was our guest speaker. He spoke on the creation of a Global Animal Welfare Rating that he has been working on with Whole Foods. This is a consumer driven project that brought the beef animal producers and the animal rights groups together in the same room. The group developed animal rights guidelines for producers to follow so that consumers would look for the fair treatment of animals in beef. Consumers have become more concerned about where their food is coming from. The labeling may start as market driven but consumers will eventually want it to be legislatively enforced. We expect to see legislation on both state and federal levels concerning the labeling of food sold from local sources. There are already signs of Food Safety and Nutrition Education bills being submitted for the coming session. There presently are proposed bills emerging for the creation of instructional school gardens following the example of California which developed the Garden in Every School Initiative in 1995. People are recognizing the educational and health benefits of gardens. They hope to increase the students preferences for fresh fruits and vegetables.